What if you had taken that left instead of the right? Would you have avoided that accident? Would you have met your future spouse who was pulled over on the side of the road with car trouble? I suppose in the big scheme of things we ask ourselves that question often. I know I do. As I look across the sea of friends I have on Facebook I wonder if I would know many of them if I had never worked at Courtesy Home Center in Forest Park. I can literally trace a couple hundred friends through that one connection alone. What if I had told my buddy Rob that I wasn’t interested when he approached me about the part time job? Would I have taken the journey to Urbana-Champaign and taken the partial scholarship to the University of Illinois? Hell, I could be practicing law now. I could be an FBI agent. Or, I could be flipping burgers or working fries. I’ve written about “what if’s” before. Maybe so many times that it has become dull and boring. But, perhaps, just perhaps, I do so more for me than you. And, if I need to do it for me so often, perhaps you need me to as well. After all, we’re not alone in this madness. So here’s the deal. What I have realized for years is this notion that we are all the sum of our decisions. Some have been good, some…well…not so good. But in the end, they are all OUR decisions. Choices that we’ve made that we think will help guide us in the right direction. Trouble is, when they don’t quite work out, we tend to blame others. We tend to look at all of the things that made that made that decision…poor, instead of taking responsibility and owning it. I’ve been asked time and time again if I believe in destiny. I’ve been asked if I believe that our end game is already laid out. And each time I answer with an affirmative. In my mind, it doesn’t matter what choices you make or what path you take, because they are all going to lead to one inevitable conclusion…you WILL end up exactly where you were destined to. In recent months and weeks I’ve had to remind myself of that. To maintain my sanity and reduce anxiety about what to do next, or when questioning a choice I’ve made or did not make I’ve had to remind myself that in the end…it’s ok. And it’s not that what I do doesn’t matter. In fact, it all matters, it’s all important. But more important is me trusting in myself, trusting in my decisions, and trusting that my destiny is still viable…even when it seems like I’ve screwed up. Maybe it will take me a little longer to get to the endgame. But I will get there. So the question is…can you trust yourself? Can you believe in yourself enough to stop asking “what if”? 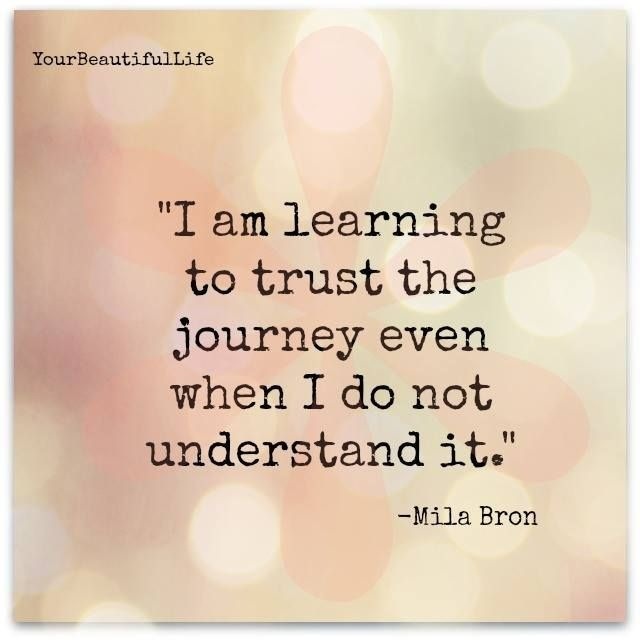 Can you just trust in and enjoy the journey and believe that everything will be ok?